On Tuesday, April 29, protests ensued in Norway when the Norwegian government refused to officially receive the Dalai Lama. Hundreds of people rallied outside the parliament in Oslo to voice their support for the Dalai Lama’s visit. According to reports of the Norwegian media, including the Views and News from Norway, over 400 Hundreds rallied outside the parliament in Oslo on Tuesday, April 29 to voice their support for the spiritual leader of Tibet's visit, and their anger at the Norwegian government for refusing to officially receive the exiled Tibetan spiritual leader. "The more they've closed the door, the more we've engaged and said we won't find ourselves in this," Ann Kristin Espejord, a rally organizer told Norwegian Broadcasting (NRK). "We cannot accept that they won't meet the Dalai Lama [...] we cannot submit to force and threats." The 78-year-old Nobel Peace laureate is due in Oslo on 7 May to celebrate 25 years since he was awarded the Nobel Peace Prize. It's a private visit, and the government confirmed on Friday there would be no official reception to avoid further damaging relations with China, as the two countries struggle in a diplomatic freeze. Espejord said the government's position was out of line with the wishes of the people. "We want the Dalai Lama to know that he is warmly welcome in Norway, and we are proud that he's coming," said Espejord. "We will stand up for our values. This event is to show what we want, that we will have enough backbone to stand." Liberal (Venstre) party leader Trine Skei Grande said the former Nobel Peace Prize winner would not be received "in the basement" as the Chinese media had suggested, but would be brought to parliament to meet "as many politicians as we can manage to scrape together. We will show that people are concerned about the cowardice displayed." "We should at least give him a proper welcome next week, and I hope as many as possible come back here on Tuesday to wish the Dalai Lama welcome," added The leader of the Norwegian Peace Council (Norges Fredsråd) Hedda Langemyr. Attendees were also encouraged to hang white ribbons on a tree, to symbol dignity and peace as a gift to His Holiness the Dalai Lama. The University of Oslo will host an appearance by the Tibetan spiritual leader during his visit. In newspaper Aftenposten on Wednesday, academic Nina Witoszek and China expert Harald Bøckman wrote that the Norwegian government had "fallen to its knees" without a single promise from China about improving relations with Norway. They said, it was naïve to hope Norwegian salmon and marine equipment exports could be saved simply by being nice to the Chinese. "The Chinese government is known for not forgetting the old sins of others, and for using them to bully and intimidate their opponents when it comes to "Chinese interests"," wrote Witoszek and Bøckman. "The Chinese like to use smaller countries as a laboratory to test its power. When they meet opposition, it seems they like [...] to test how far they can go. Saying no to the Dalai Lama strengthens China's contempt for the present weakness!" The pair proposed King Harald receive His Holiness the Dalai Lama instead. "The most appropriate, in our opinion, would be if the Dalai Lama got to meet King Harald. Both are known for their senses of humour and would surely have a nice time together." Despite the fact it's a private visit, the Dalai Lama will be housed at the Grand Hotel in central Oslo and receive the same levels of security as if he was on an official visit, reported NRK. "The Dalai Lama and his entourage will at all times have security personnel around him, and we will arrange for a safe accomplishment of events," said Johan Fredriksen from Oslo police. The measures are based on a threat assessment by the Norwegian Police Security Service (Politiets sikkerhetstjeneste), and may be enhanced leading up to the visit. "The Dalai Lama tends to stop and greet people when he goes from place to place," said Wenche Stene, from the committee organizing the visit. She was hopeful that the heightened security would not hinder the public's access to him. "We expect that he will also do that in Oslo." "Norway is in a uniquely difficult situation when it comes to the relationship with China," Foreign Minister Børge Brende told NRK, adding: "I do not know of any other Western country that has not had political contact with China for four years." 'That hasn't won Brende much sympathy or respect for what many consider kowtowing to the Chinese government,' NRK reported. The former Nobel Peace Prize winner, Archbishop Desmond Tutu of South Africa was also disappointed in the Norwegian government for refusing to meet the Dalai Lama. "I have always had great respect for Norway," he told NRK, adding that "it was now gone." 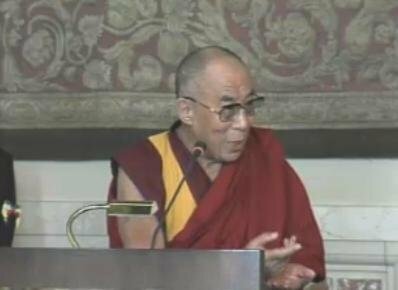 The representative of his Holiness the Dalai Lama in Europe, Mr Thubten Samdup, told Norway's NRK, "I think the Norwegian government should consider that by not meeting His Holiness the Dalai Lama, they are sending a chilling signal to Tibetans, which is exactly what the Chinese want."